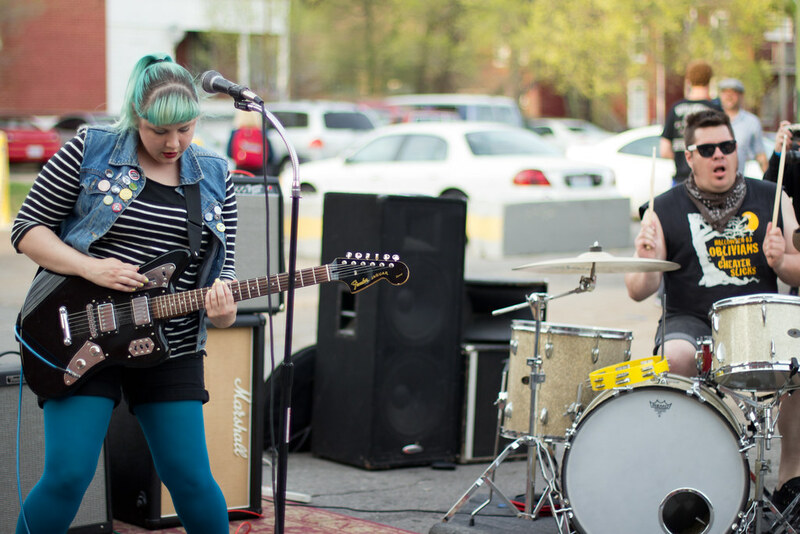 Bruiser Queen on Record Store Day 2014. Photo by IWTAS. After we took a very extended holiday weekend, we’re excited to bring you today’s most excellent STL Song of the Day by garage pop duo Bruiser Queen. BQ is heading out on tour with Brooklyn’s Crushed Out, and they’re doing us all a favor by starting the trip right here in St. Louis, with a performance tonight at The Demo with Crushed Out and FIRE DOG (STL). “On The Radio” is a real hoot of a demo, and it can be found on the band’s RSD 2014 7″ split with The Turn It Offs. You can buy the tracks digitally, but I bought a physical copy of this one from Apop, and will attest that it’s a really lovely little piece to have in your record collection. Bruiser Queen is Jason Potter and Morgan Nusbaum.